On a scrap piece of paper, figure out how you’d like to “group” your schools based on the number of application versions you’ll need to create. Perhaps you need two groups: one where you’ll be applying as an economics major; and one where you’ll be applying as a business major. Only add the schools from group 1 to your application list first. These schools will now be linked. When you’re ready to create a copy of your application, add the second group of schools to your list. On the “application” page, click on the “start new” button if you want a blank application that you have to fill out from scratch; or select “start as copy” if you want to pre-load information from a previous version you created. If you do the latter, you’ll still have the option of editing or tweaking any sections you like. Pay your application fees and complete any required supplements for colleges that ask for additional essays or school-specific information. To request that your teacher or school counselor complete a letter of recommendation, click on “school forms” at the top of the main page. You’ll note that required forms are grouped by form type. Examples include: early decision agreement; first marking period; instruction recommendation; school report; midyear report, etc. So let’s say you want a teacher to submit a letter of recommendation to the University of Rochester on your behalf. 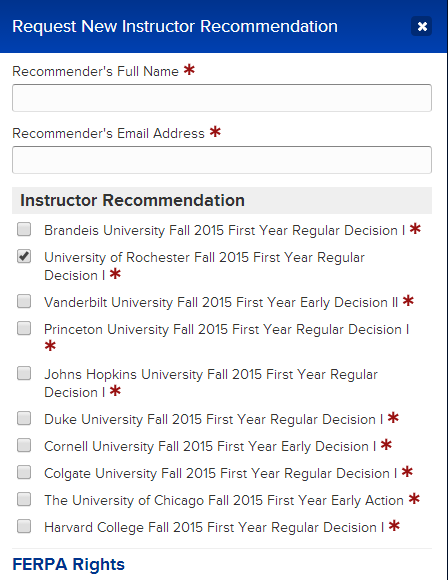 Under the “instructor recommendation” section, click on the “request new instructor recommendation” button. You can then choose which schools that teacher will submit his/her letter to. Note that your teacher/school counselor must have a valid email address to complete the online form. Printable PDF versions of the recommendation forms are available at www.universalcollegeapp.com should your teacher/counselor prefer to submit his/her letter offline. ✔ Application Tip: Should you run into any difficulties while completing the UCA, click on the “help” link from any screen (it’s located in the upper-right hand corner) or visit https://applywithus.kayako.com/uca. That’s it! You’re done. Given this is my first time using the Universal College Application, I cannot overstate how impressed I am by how intuitive and user-friendly this system is. If only more colleges would join the UCA membership group, the Common App would really get a run for its money!